The easiest to find particularly on the shores of Peucang islaand are the brilliantly coloured reef browsing fish with colors and patterns from nature at its most vivid and creative. Delicate yet boldly patterned butterflyfishes come in various shades white, yellow and orange with black markings and often have a black vertical stripe through the eye. Usually found in pairs, when alarmed they use their fins and spines to firmly wedge themselves in crevices in the reef. 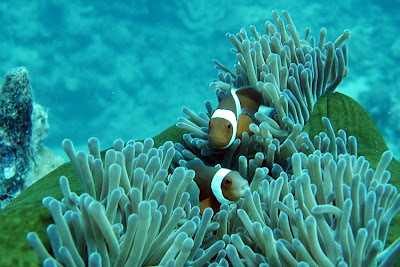 The most common clownfish in Ujung Kulon are golden brown in color white bands across the body. Often found sheltering amongst the tenntacles of sea anemones, the mucous of the clownfish contains a substance that makes the stinging anemone believe it is one of its own. Other outstanding fishes include the imaginatively patterned angelfishes of which the Emperor Angelfish with thin blue and yellow horizontal striped and a bright orange tail is a wonderful example. Often the larger fish are just as eye-catching with briliant red rock cod and snapper, orange striped trigger fish, banded and mottled morays eels and exquisitely paterned surgeon fish. The colorful parrotfish has teeth that are fused into a parrot-like beak with which it crushes corrals and molluscs into fine coral sand. They sleep inside lose cocoons constructed of mucous, sand and weeds in crevices in the reef. Marine mammals that visit the coastline include the regularly seen dolphins and the unusual and rarely seen dugong or sea cow. The reef builders, the stony or hard corals make up the reefs of shallower waters. During the day many of these area are dull brown color but at nights they are transformed into miniature marine forests of plankton feeding tentacles. Hard corals are built from the skeletons of tiny marine animals called polyps and come in a wide variety of shapes. These can resemble rocks or branching stag horns, be flat-topped or cup shaped, appear like up-turned mushrooms or have fungi-like folding contours. Their color tend to be more subdued than the soft corals because of the extra sunlight in shallow waters. The soft corals, colonizers of established reefs, do not have the limestone skeleton of the reef builders and instead are numerous polyp gathered around a fleshy centre. Their lovely formations vary from fan-like shapes to branching varieties or have finger-like tendrils and whips in colours that vary from the delicate to the vivid. The more delicate or leafy forms tend to be found in deeper waters as they are too fragile for strong currents. The mudflats and stream of Ujung Kulon also hold a fascunating array of life forms. Mangrove swamps, rich in nutrients aare home to two unique speciesof fish, the mudskipper and the archerfish. The bulging-eyed mudskippers, constantly seen hoping across the water surface, often venture onto land but must return to the water to replenish their gill chamber reserves. Mudskippers also have the most unusual attribute of being able to climbing trees. The clever little archerfish is named for its practice of squirting shafts of water over 2 metres high to knock insects off overhanging leaves. Yet another fascinating fish, that lives in the fresh waters of the park is a tool using fish. It clings to the underside of floating leaves which it then manoeuvers, often against the current and from its hiding place preys on smaller fish. Ujung Kulon is alive with crabs of many sizes and colors. Perhaps the most common is the small withish Ghost crab, aptly named because of its quick disappearances, which deposits tiny sand balls in fan shapped designs on beaches. Hermit crabs are the species that live inside shells, exchanging them for larger ones as the crab matures. The laarge holes found onn the forest floor, sometimes many kilometres from the sea, are made by mature hermit crabs that have abandoned their shells. Fiddler crabs of colors that include bright red and turqoise are also easily identifiable because they have one claw far larger than the other and are sometimes seen engaging in group claw waving sessions in defense of their holes. the reefs and waters of the Park have an enermous variety of marine life. A vast world of shells, sponges, anemones, slugs, seahorse, squids, sea cucumbers, lobsters, shrimps, snails, jelly-fishes and worms- these are just a few of the numerous creatures for visitor to discover.